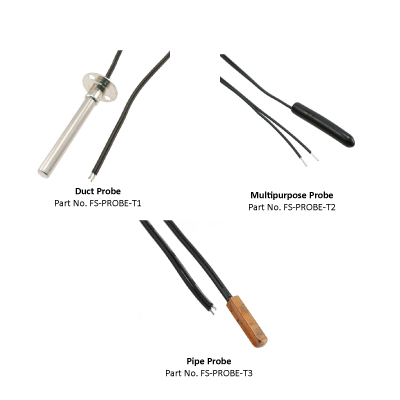 The FS-Probe-T1 is a certified Founten 10K temperature probe for detecting air temperature in a closed duct system. The flat end of the probe is able to seal against a metal surface to reduce air leakage. Common applications for this probe would be supply or return air temperature monitoring. The FS-Probe-T2 is a certified Founten 10K temperature probe for detecting temperatures in a variety of environments. The probe is housed inside of a vinyl cover making it water proof and weather resistant. Common applications for this probe would be outside air or water temperature monitoring. The FS-Probe-T3 is a certified Founten 10K temperature probe for detecting the temperature of a pipe or metal surface. The probe is housed in copper allowing for accurate temperature conductivity. Common applications for this probe would be detecting boiler or chiller pipe temperatures.